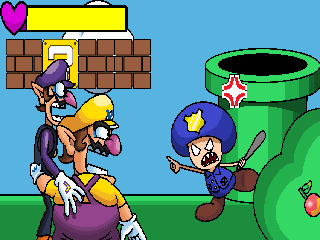 Wario and Waluigi are just two little love birds stuck in this cruel world where the police arrest people of their kind. Help them love each other with out the police finding out in this quick little comedic video game. Please refrain from just needlessly talking bad about someone's game. The concept is silly, but honestly it's by no means a poorly made or otherwise hateworthy game. Fun game LOL. it was actually really funny... and im LGBTQ. I hope you get a good review soon. lol that was pretty funny. Quite interesting and fun. I might write up a review.